This past fall I had the privilege of having Lynn Elmhirst from besttrip.tv join me in the studio to film a special segment titled “Meet The Makers”. Lynn and Peterborough and the Kawarthas Tourism have created a wonderful series featuring various makers in the Peterborough community and highlighting their creativity. Please take a look and step inside my studio. One of my favourite views in Peterborough is the contemporary Art Gallery on the shore of Little Lake in the heart of the city. It is not only aesthetically wonderful, it also hints at a facet of a city perhaps better known in the past for hockey culture and its world record-holding historic Lift Lock. The Art Gallery is there in bright, contemporary splendor in an otherwise traditional park setting. You know it’s there, but it still never fails to make you catch your breath and look twice. There’s a core of the Peterborough and the Kawarthas community of artists and Makers that is just like that gallery. It embraces the modern, the experimental, and the risk-taking, still inspired by the region’s truly splendid natural setting. So exploring the community’s art scene produces unexpected gems. 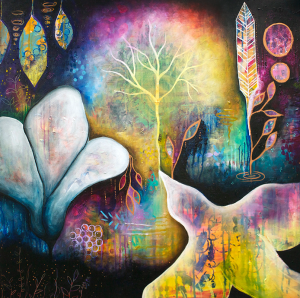 Mixed media artist Briana Gosselin embodies that spirit. 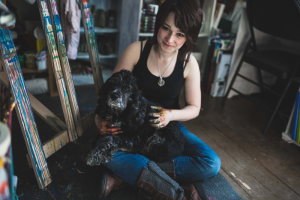 Identified as one of Canada’s Top 30 Under 30 artists, she’s an intuitive artist, a modern approach to creating art without being intent on knowing what the finished product will look like. To Brianna, it’s about looking at the world differently and allowing changing energies to guide the Maker – not a preconceived notion of what something should be or how a concept should be delivered on canvas. Liberating, but also a bit scary, right? Brianna compares the adult art classes she teaches to therapy and finds it therapeutic herself. 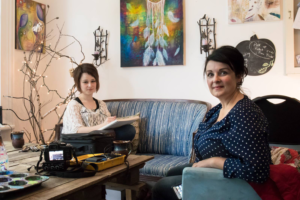 But it’s an approach to art that Brianna finds suited to her artistic expression and even to her studio’s location in the heart of Peterborough’s historic downtown, with both 150 year-old trees and quiet courtyards and the pedestrian energy of the street outside. “Nature inspires me but I find people fuel my creativity. I need to be able to around people, I love to be interacting with them and feeling the energy that comes off them.